Project Sunshine is an organization through Texas A&M University dedicated to working with children who have long-term illnesses and disabilities. They host numerous events throught the year such as carnivals, dances, movie nights and have big trips such as a visits to the Waco Zoo and Santa’s Wonderland. All events are offfered at no cost to the families and siblings may participate so that no one feels excluded. Their main goal is to provide friendship to your child while bringing a smile to their face. In addition to hosting their events, they also have a Buddy Program. This is an optional program both for the child and their members. If their members wish to have a buddy, they are required to visit their buddy at least once a week on their own time. The arrangements on when to meet, what to do, are completely decided by you, the parent, and the Project Sunshine member. Friends Gathering Respite Care is a no fee ministry of Christ United Methodists Church run by volunteers. Participants must live at home or at an independent living facility in the Bryan/College Station area. Caregivers are welcome to attend the program. Friends Gathering provides mental stimulation and socialization opportunities for participants. It is offered the first and third Thursdays of the month from 10am until 1pm at Christ United Methodist Church in College Station.. Contact Ann Boyle at amboyle1951@gmail.com for more information. To download this year's copy of Success for Today and Tomorrow's local resources guide in English click here. Click here for the guide in Spanish. A non-profit organization dedicated to creating opportunities for individuals with intellectual and developmental disabilities. The Arc provides information on advocacy, educational training, and local and state resources. BIIN's mission is to promote the human dignity and wee-being of all immigrants in our community and to advocate for and facilitate better access to legal, educational and social services. Current programs include Information, Referrals & Assistance (IRA) which provides clients with direct service or appropriate referral to resources in BCS. Walk-ins are seen Tuesdays and Thursdays from 6pm-8pm and Saturdays from 2pm-4pm, with no appointment necessary. Visit http://brazosimmigration.com/ for more information. A not-for-profit 501(c)3 organization providing peer support, information and referral, independent living skills training, and advocacy to persons with any type of disability at no charge. Serving any age, including school-age through transition & life skills. Email: info@bvcil.org. The public library system has books on Autism, developmental disorders, and sensory integration disorder. Search online or visit your local library. 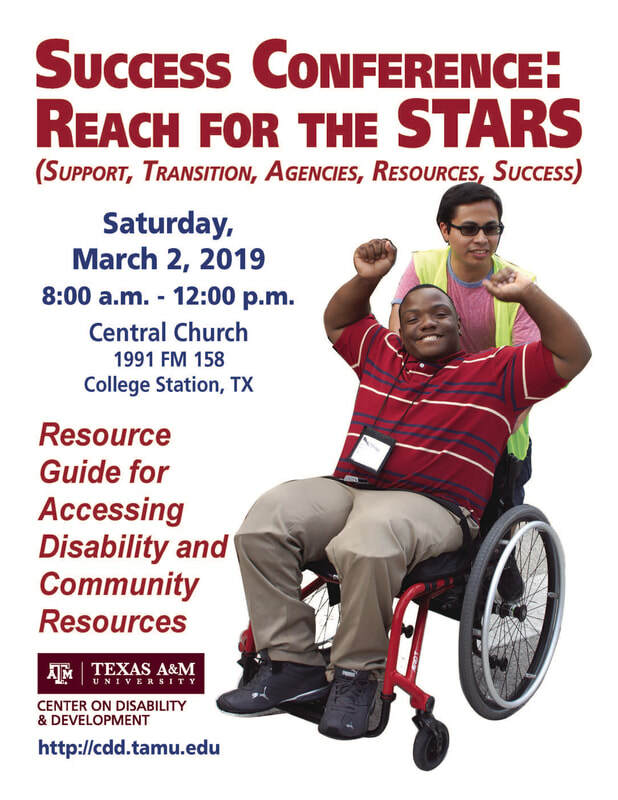 The Center on Disability and Development at Texas A&M University (CDD) supports the self-determination, community integration, and quality of life of people with disabilities and their families. As a federally designated University Center for Excellence in Developmental Disabilities (UCEDD), they are part of a national network of similar centers across the country, and serve as a resource to the community in the areas of education, research, and service as relates to the needs of people with disabilities. The mission of the Gluten Intolerance Group of North America® is to provide support to persons with gluten intolerance, including celiac disease, dermatitis herpetiformis, and other gluten sensitivities, in order to live healthy lives. GIG Branch Mission: GIG’s branches help to fulfill GIG’s mission on a local and regional level through programs tailored to their community. NAMI is the National Alliance on Mental Illness, the nation’s largest grassroots mental health organization dedicated to building better lives for the millions of Americans affected by mental illness. NAMI advocates for access to services, treatment, supports and research and is steadfast in its commitment to raise awareness and build a community for hope for all of those in need. NAMI offers a support group for families who have children with mental illness. A new Teen Support Group will being in August 2018 and a new NAMI Group will begin in Caldwell in July.